Negotiators are refining a proposal that would insist that every car include more North American parts. 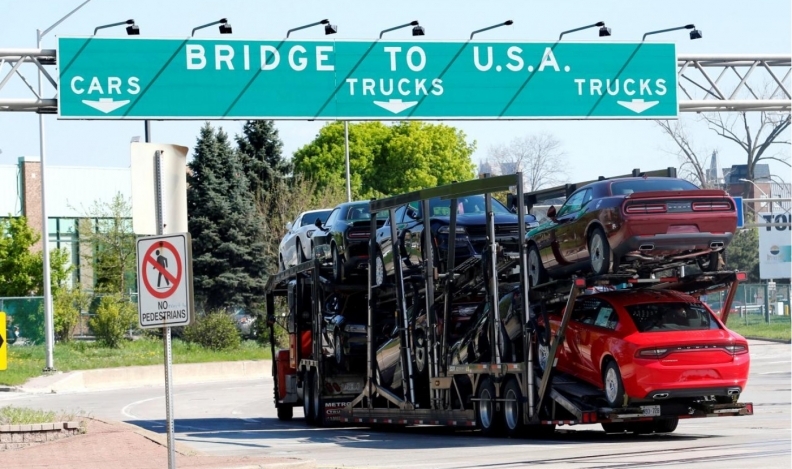 WASHINGTON — New NAFTA rules could increase the cost of a car by hundreds or even thousands of dollars, act as a multibillion-dollar tax, and ultimately hurt sales as consumers keep their wallets shut, a new study predicts. The study by the Center for Automotive Research attempts to predict the impact of proposals under consideration as the three North American countries huddle in a marathon negotiating session in Washington to try getting a deal. Negotiators are refining a proposal that would insist that every car include more North American parts; use primarily North American steel; and favour production in high-wage jurisdictions, meaning the U.S. and Canada. The study calculates that at least 46 vehicle-types currently produced on the continent would fail to meet these new standards, more than doubling the current number of products that fail to comply with existing NAFTA rules. The companies making these vehicles always have a choice: comply with the NAFTA rules, or pay the tariff, which is 2.5 per cent for a light vehicle in the United States, 6.1 per cent in Canada. The study offers a broad estimate, with a range of outcomes. It finds that 25 to 87 per cent of vehicles currently sold in the U.S. would fail to meet the standard and would wind up paying a tariff. "Tariffs [would] add at minimum a US$2.1-billion to US$3.8-billion tax on U.S. consumers," said the study, released Thursday. "The tariffs would add between US$470 and US$2,200 to the cost of these particular vehicles ... [and] the result would be an estimated loss of 60,000 to 150,000 annual U.S. light vehicle sales." The group behind the research is funded by the auto industry, governments, unions and other organizations. The study was commissioned by Trade Leadership Coalition, an industry-funded group. But its findings are consistent with the view of Jeff Rubin, a senior fellow at Canada's Centre for International Governance Innovation and a former chief economist at CIBC World Markets. He says that under the current NAFTA many groups win: consumers with cheaper cars, car companies with higher profits, and Mexican auto workers with higher salaries than Mexicans in other sectors. The losers under the current NAFTA, he says, are auto workers in the U.S. and Canada, where employment has dropped, and, Rubin says, the auto sector faces a long-term terminal decline. He's unsure the new NAFTA rules will change that. He said it's a no-brainer for companies trying to decide whether to adjust practices to comply with the new rules. He figures compliance with NAFTA might add five per cent to the cost of a vehicle, versus the tariff of 2.5 per cent for light vehicles sold in the U.S.
"If I was a shareholder at [auto-parts-maker] Magna, or GM, I know what I would be telling management to do — which is, instead of tripling wage costs [in Mexico], pay the tariff," Rubin said. "Ultimately GM and Magna are going to do what's in the best interest of their shareholders. And right now the best interest would be keep the production in Mexico, pay the low wage rate, and pay the 2.5 per cent tariff." As long as the tariff remains low, Rubin added that the new NAFTA will be "a paper tiger." However, it would be "a totally different ball game," if the countries raise their tariff, he says, arguing that it would make paying the higher cost of compliance the better alternative and steer production back to the U.S. and Canada. "It would be a total game-changer." But under the current proposal, with no change to the tariff level, Rubin sees the new NAFTA as producing a 2.5 per cent added tax on cars and no improvement in the lives of Canadian and American workers — a scenario that "isn't going to bring a single job back to the U.S."